This bangle is the adult version of a friendship bracelet. You can make one for yourself and for your BFF in her favorite colors. Go glam and make a set for date night using assorted metallic threads. The materials are basic and easy to find, you could even upcycle an old plastic bangle to make this project. Best yet, these only take an hour to make! You can rock these by color for each season. I chose a beach watery theme, but you could go red and green for Christmas. Black and Orange for Halloween or Red, White and Blue for the 4th of July! wood bangle bracelet - I used one from DIY Bangles that is 1/4" x 3" with a flat exterior shape. Undo the first skein of floss and cut an 18" length of thread. 1. If you are right handed, place the tail ontop of the bracelet with the tail facing to the left and held securely by your left hand. If you are left handed follow these instructions in reverse beginning with the tail facing to the right and held by your right hand. 2. With the tail securely held, proceed to wrap from right to left over the tail pulling firmly as you go. 3. Continue wrapping until you have covered a desired amount. 4. Thread your needle with the remainder and tuck it under the portion you have wrapped. 5. Pull the needle through and trim away excess thread. Trim away any tail that may still be seen. 6. Proceed to the next color repeating the same procedure, beginning with cutting an 18" length of thread. 7. Continue working in the same manner with each color in sequence. 8. I worked a 4 color repeat 4 times. I didn't concern myself with each wrapped section being equal in length, though you can certainly measure by counting wraps or using a ruler. 9. Keep for yourself or gift as a gift. Collagraphy is a printmaking process. There are a variety of ways to do it, but I love using the simple material of an old file folder for the print plate. The image is from a art class I taught one summer and was made by a 9 year old. The results can be spectacular. Sketch out your idea on a sheet of paper the size of your file folder. Do you want to create a clown? A landscape? The trick to a great collagraph is to make the image with plenty of negative space. To make this clown, each distinct feature of the face and costume were drawn, but not the base of the head. There is space between the lips and the bow tie, the nose and the lips etc. The second trick is to make your image big, bold and simplistic. A tiny clown face with lots of details just won’t print as well. Cut the file folder in half along the fold line. Use one side as print base and the other to cut out your shapes. Draw your shapes, cut them out and arrange them on the print base. Once you have an image you like, glue the pieces into place. Make sure you get the edges of each piece! You don’t want any to curl up when the glue has dried. Allow the glue to thoroughly dry before proceeding. Use a paper towel to wipe off any globs of ink that remains on your print plate. You will be able to make 4-5 prints before the plate is worn out. Let your prints dry and arrange them in a collage like this example or use them to make cards, posters or covers for your journal. *** Please note I was given supplies by Smoothfoam to make this project. for my skinny wrists, so I especially love that I can cut the leather bands to size. Use the tape measure to measure your wrist. You decide how tight a fit you want and then cut (or not) the band to size. Each band also comes with rubber stoppers. Arrange the various slide components in an order you like and then slide them onto the leather band. Add the rubber stoppers if you don't want the components to slide. Add glue inside the cup of each end piece and add to the end of the leather band. Be sure to allow your new creation to dry overnight! *** Please note that I received the materials from Cousin to test out for free. Do you have a particular image of your child’s that you love and think would be fabulous as an embroidered pillow or as part of that newly refinished kitchen table? The process couldn’t be simpler! If you are working with cloth, iron out all the wrinkles. Tape it to a hard surface. Place the carbon paper, ink side facing the cloth, table or whatever your project surface may be. Position your child’s drawing on top of the carbon paper and tape it in place. Trace the lines with a knitting needle or chopstick. You could use a blunt pencil, but you will end up leaving a mark on your child’s drawing. Remove drawing and carbon paper. This project isn’t of course limited to children’s drawings. It is a great way to transfer your own images too. Free Pattern :: (KAL) Knit along, Knit an afghan one square at a time. This stitch lays flat. It is reversible. Great for scarves and edges on garments, like a cuff or collar. The trick to this stitch is to knit the purl stitches of the previous row and purl the knit stitches of the previous row. This is a great one for learning to read your stitches. This is it! Squee! I am so excited to share a Knit along project with you. I was at Vogue Knitting Live, Chicago 2018 and while listening to a speaker suggest that you buy an extra skein to make a larger swatch than the typical 4"x4". I thought brilliant! Yes, I should do that too, if only to get a better sense of the fabrics drape. So I am setting out to review the basic library of knit purl stitch combinations in a 7"x7" format. Each square will be collected to make a blanket. I wanted a project that could be created in small bits as dragging around giant knit projects to the local coffee shop is a tad annoying. Smaller is also good for summer. Start now and you could have a 49" x 63" blanket ready to go for next winter. How cool is that! So the way this will work is each Sunday evening at 8pm I will be live streaming on Periscope as @lbostudio. Tune in to watch me. I will be answering knit questions. Sharing with you what I've learned from 45(!) years of knitting and working in the industry in various capacities. I've owned a yarn store, was on the board of the yarn trade association, and design for books and magazines. I am sorry that the video is cut off. YouTube gives me a time limit of 14 minutes of a 23 minute broadcast that I am allowed to upload. You may watch the full replay on Periscope. I will also upload what I can onto YouTube. I am keeping my palette simple. I am working with just three colors, french blue, cream and camel. I am using Cascade 220. A nice sturdy basic wool in a worsted weight. To do this for charity, Warm Up America is my charity target. They ask the rectangles be 7" x 9" and knit in acrylic. So make it in wool for yourself or acrylic for charity, make it in pastels for a baby blanket or two. The project is truly flexible. You could also work with a washable wool. This is challenging me to think about the basics in groups so that they make sense and you build skills. Photography is my other challenge. Not my strength. I prefer to photograph in natural light and there has been rain in my hometown for nearly two weeks solid. So hopefully as time goes, my photos will improve. Basic math: 3 colors 2000/220= approx 9.0909 skeins of yarn. As I am working with 3 colors, that is 3 skeins of each color. Basically you want a worsted yarn that works up to 4 stitches to the inch on an 8 needle. If you want to destash and mix up yarns, that's fine but stay on gauge. Afghan / Blanket Size: 49" x 63". So if you are knitting 7" x 7" squares that will be 63 squares. Multiply by only 4 squares a week - 16 weeks to complete. Start now to be done by Fall 2018. If you are knitting 7"x9" rectangles for Warm Up America. that will be 49 rectangles. 4 patterns a week, , 13 weeks to complete. Again Start now to be done by Fall 2018. Spray bottle with water to block. Start with the basic Seed Stitch. When you see *K1,P1* that means work the K1,P1 across the row. Work the stitches in order as presented. They build upon each other. The texture is more subtle than seed with the addition of the knit row every other row. Pin a safety pin to the wrong side of the fabric so you always know which side you are on at a glance. 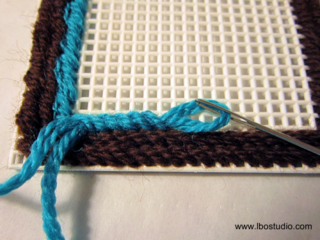 l presonally love this stitch. It is quick and subtle. Great for jackets and vests. It is not fully reversible. It sort of looks like Sand. It doesn't curl. The texture is more subtle. A great one to work into a fisherman style or Guernsey sweater. This one is also called Double Seed stitch. You can see why as it works up just like seed but everything is doubled. Another sturdy one that lays flat and is reversible another good choice for a scarf. I love it in cardigans along the lower 2 inches before I move into stockinette.